When all the input is processed, we observe the system's final state to determine whether the input sequence was accepted or not. Alphabet: also referred to as Language, is the set of all valid inputs. Let's create a Finite State Machine that parses a binary sequence where every time we encounter a 1, we immediately encounter a 0. For example, 1010 is a valid input sequence but 1110 and 1010100 are not. 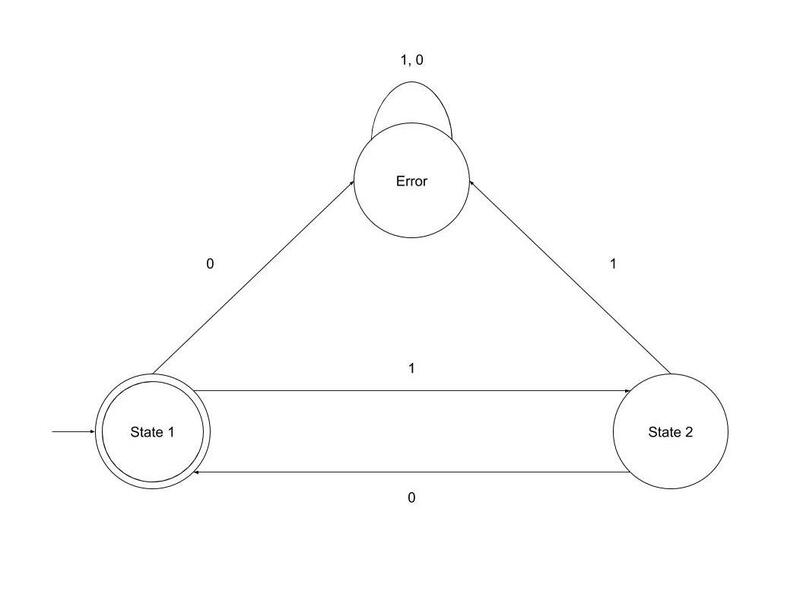 Our Finite State Machine has 3 states: State 1, State 2 and Error. If we're at State 1 and encounter a 1, we move to State 2. If we're at State 2 and encounter a 0, we move back to State 1. If we're at State 1 and encounter a 0, we go to the Error state. If we're at State 2 and encounter a 1, we go to the Error state. As you would observe, any input in the Error state keeps it there, as you are not able to transition out of the error state. """A change from one state to a next"""
"""Determines if the state and the input satisfies this transition relation"""
"""A basic model of computation"""
"""Before we use a list of transitions, verify they only apply to our states"""
"""Looks to see if the input for the given state matches a transition rule"""
"""Process an input stream to determine if the FSM will accept it"""
The Transition class contains a match() function. A quick way for us to know if the current state and input of the Finite State Machine will allow us to go to the next state defined. The FSM class, after being initialized, needs the add_transitions() method to be called. This method validates that our transition rules are set up with valid states. We can then use the accepts() method with a list of inputs to determine if our machine would be in an accepting state. Finite State Machines are commonly used in real world systems that extend beyond string parsing, and even beyond software systems. States: a traffic light generally has three states: Red, Green and Yellow. Accepting States: in the real world traffic lights run indefinitely, so there would be no accepting states for this model. Alphabet: positive integers representing seconds. If we're in state Green and wait for 360 seconds (6 minutes), then we can go to state Yellow. If we're in state Yellow and wait 10 seconds, then we can go to state Red. If we're in state Red and wait 120 seconds, then we can go to state Green. States: For our simplistic shooter we can have: Patrol, Attack, Reload, Take Cover, and Deceased. Initial State: As it's a guard, the initial state would be Patrol. Accepting States: An enemy bot can no longer accept input when it's dead, so our Deceased state will be our accepting one. Alphabet: For simplicity, we can use string constants to represent a world state: Player approaches, Player runs, Full health, Low health, No health, Full ammo, and Low ammo. If a player approaches, go to the Attack state. If we run out of health, go to the Deceased state. If ammo is low, go to the Reload state. If health is low, go to the Take Cover state. If the player escapes, go to the Patrol state. If ammo is full, go to the Attack state. 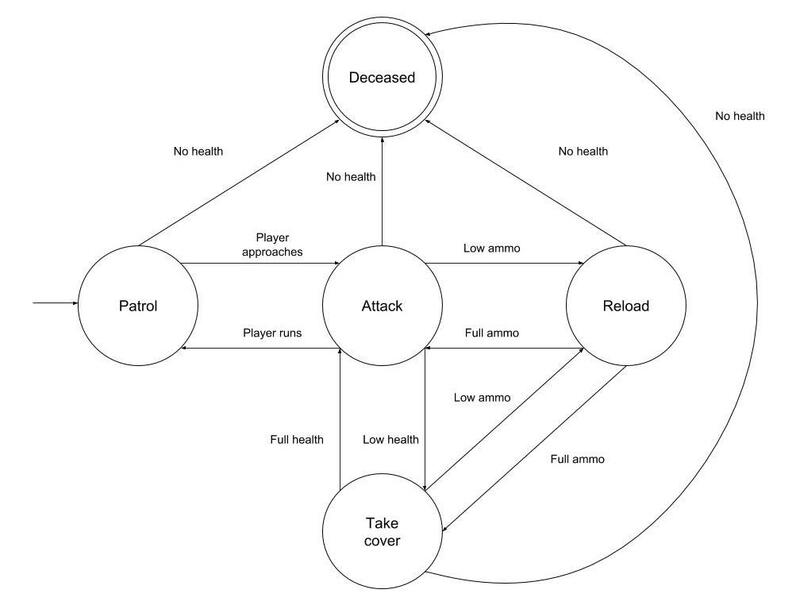 If health is full, go to the Attack state. The primary benefit of Finite State Machines, their simplicity, also becomes one of their disadvantages. Systems which need an indeterminate amount of states cannot be modeled by a Finite State Machine, evidently. Earlier we modeled a Finite State Machine that accepted the string '10' for any amount of iterations. If we had to accept a string of any number of 1s followed by the same number of 0s, we cannot create a Finite State Machine for it. 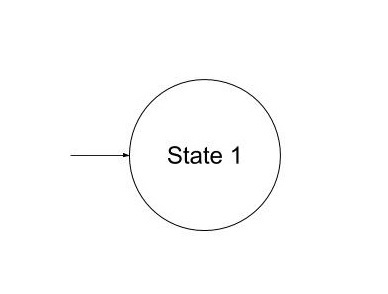 A Finite State Machine does not keep track of the number of states it visited, it is only aware of the current state it is in. This is proven by the Pumping Lemma, a proof which asserts that if a language is not regular (not so much Regular Expressions, which you may be familiar with from programming languages, but rather a classification of languages then no Finite State Machine can be built for it. You can learn more about this proof and its implications here. Finite State Machines are a theoretical framework we can use to model systems. Given a known set of states, the starting state, the accepting state and the rules to transition between states, we can determine if a sequence of inputs would be accepted. The limited amount of states that can be modeled does not make these abstract machines suitable for all systems, as shown by the Pumping Lemma. 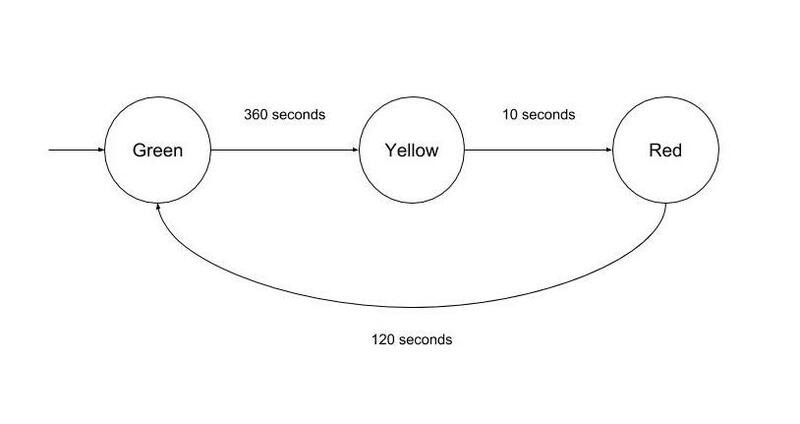 Even so, Finite State Machines have many real-world applications and are popular because of their simplicity.